I just love it when one of my favorite sources of seed and gardening wisdom puts up a post like this one on my sworn enemy — the Colorado Potato Beetle. Apparently, I am not alone in my extreme dislike, okay hatred, for this little striped tank of a beetle. Colorado Potato Beetles can strip plants almost overnight, each female lays hundreds of eggs….and all of those little larvae eat like a hungry Olympic wrestler (think 6000 calories a day). Check out High Mowing Organic Seeds post on what these babies are, where they came from and how to handle them if they show up in your garden one sunny morning! Oh, and Grow So Easy Organic: Organic Gardening for the Rest of Us –the book — is in final transfer to the MOBI (Kindle) format, a bit later than expected but coming to you soon! 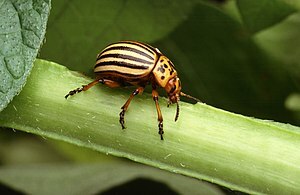 via The Unique Challenge of Colorado Potato Beetles | High Mowing Organic Seeds Blog – The Seed Hopper. This entry was posted in Gardening Tips, Organic Gardening, Tools for the Organic Gardener and tagged Colorado Potato Beetle, High Mowing Seeds, organic gardening tips. Bookmark the permalink.